Markdownmom loves giving gifts to family and friends during the holidays and Valentine’s Day is no exception. She has found the perfect budget conscious gift to give your sisters, cousins, mothers or girlfriends. Overstock features several diamond accent necklaces that are 40 per cent of retail or greater. Markdownmom likes the sterling silver diamond accent heart necklace for $37.99 (58% off retail). The open-heart pendant is made with white diamonds and sterling silver and comes with a round cable chain. Hurry while supplies and pricing lasts! The Dregs Of Summer Offer Real Bargains! It’s September and one can only visualize those great summer sales of July and August, but don’t give up yet! Even though the inventory of those clearance buys is extremely limited, the price reductions of 75% to 90% off more than make up for the lack of selection. Since consumers have shied away from luxury items like jewelry, you will find some great bargains in this category. MarkdownMom found some great finds at Shopko and Macys with real gemstone and stone jewelry at bargain basement prices. For instance, at Shopko an entire collection of earrings, necklace, and bracelett of black agate over $220+ retail individually priced, came to under $30. A green leather purse from Kenneth Cole Unlisted Collection reg.$78, was bargain priced at $15.80, and Isotoner sandals, reg.$24, now only $4.99. Plus for you gardeners, ornamental grasses and hostas were $2 a pot, and spirea bush $5! All can be planted this Fall for Spring and Summer enjoyment next year. At Macy’s MarkdownmMom Chics bought a turquoise necklaced reg.$100, under $20. Even online a brown gauze skirt that can still be worn during early Fall in most parts of the country reg. $44, sale priced $14.40, and graphic tee reg. $24, for $4.99! Online use promo code: SAVEMORE for an additional 15% off. Instead of Christmas In July, September Is Time To Capture Bargains for Christmas! Wednesday Steal: All That Glistens Can Be Gold! Valentine’s Day is coming soon, and, yeah well flowers and candy are okay gifts, but sooner rather than later they are either consumed or dead. However, gold is forever! 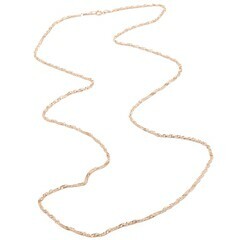 ShopNBC has this fantastic bargain of a 30″ 14K Colors Of Gold Singapore Chain reg.$80, steal at $59.00 on 5 value plays of $11.80+sh. And how about this, it comes in the super fashion colors of chocolate, green, rose, white and gold! 2.0 grams. It doesn’t get much better. Drape it, knot it, and it’s gold, Italian Gold! How good can it get? Don’t trust your guy to remember, or in between love interests? Do what MarkdownMom did, buy it for yourself. I mean, it’s gold, real gold! Fashionistas Agree Onyx Is Number One! As the fashion world harkens back to Breakfast At Tiffany’s with glamour fabrics and large chunky jewelry, onyx takes front stage as an affordable large gemstone for all fashionistas. As Vera Wang has said “Gimundo” is the operative word for jewelry this year. Large gemstones and bib jewelry update any outfit. Among the turquoise, amethyst, smoky quartz, onyx stands out as a classic among classics. Black and white, onyx and pearls are standards that never go out of style. Markdown Mom found this super buy at ShopNBC of a 100 inches of onyx beads. Knot it, wrap it, belt it, or let it fall down your back, this necklace will make a super fantastic fashion statement! 13 x 7 mm beads continuous necklace, reg. $304.50, shopnbc priced at $179.50+sh. While shopping, check out ShopNBC’s clearance on pearls–you’ll find some of the best prices on pearls on the web here.